Listed below are trade names and common chemical names of insecticides available to homeowners for controlling white grubs in lawns. Due to the development of new and improved insecticide chemistries, season-long residual or “preventive” controls are now available. Subsequently, they are becoming the preferred management strategy. Preventative control strategies require insecticide application prior to egg lay or hatch, timing varies depending on grub species: May/June beetle; late-May – early-June and Japanese beetle; late- June – late-July. Applications of preventative control products should not be made after August 1st! 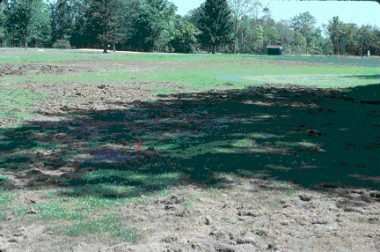 The curative control approach entails applying a control product when grubs are present, active, and causing measurable damage. 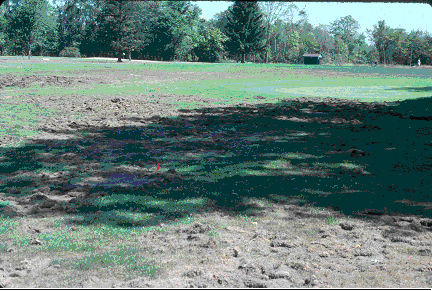 Insecticides should be applied when grubs are feeding in the root zone. However, great control can be attained if insecticide is applied to smaller or younger grubs – usually in July and August for May/June and Japanese beetles, respectively. Diazinon Numerous diazinon High No longer recommended. Remember that grubs feed in the root zone, thus the control product must reach them in order to be effective. Therefore, regardless of insecticide brand or formulation, you must water the insecticide into the root zone to achieve maximum effectiveness. Apply at least 1⁄2 inch of irrigation or rainfall on sandy soils, and up to 3⁄4 inch on heavier clay soils. Apply water within 24 hours after application to get the most benefit from insecticides. For spray formulations, wash spray off grass plants and into the soil before the spray dries. Liquid formulations of some products have shown greater efficiency.